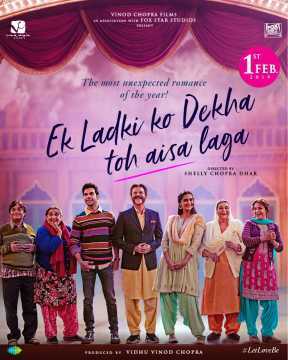 The song Ek Ladki Ko Dekha Toh Aisa Laga (Title Track) from the film Ek Ladki Ko Dekha Toh Aisa Laga(2019) released on 08 Jan 2019 with a duration of 02 minutes and 35 seconds. Ek Ladki Ko Dekha Toh Aisa Laga (Title Track) is picturized on Rajkummar Rao, Sonam Kapoor Ahuja, Anil Kapoor and Juhi Chawla. The lyrics of Ek Ladki Ko Dekha Toh Aisa Laga (Title Track) are by Gurpreet Saini. It has been sung by Darshan Raval and Rochak Kohli. The music has been composed by Rochak Kohli.